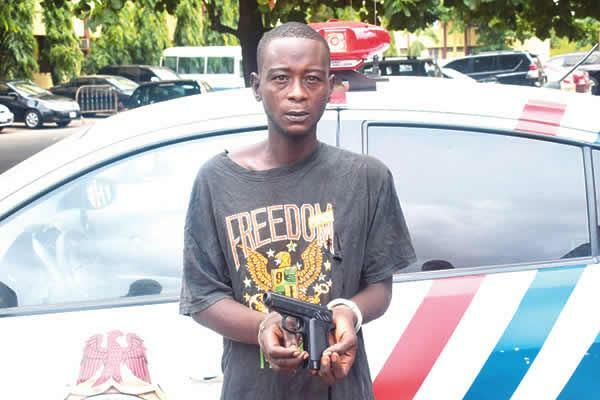 A suspected robber, Rilwan Wasiu, has been arrested by operatives of the Rapid Response Squad of the Lagos State Police Command. The 20-year-old was reportedly beating up his girlfriend on Thursday under the Adeniji Adele Bridge when he was caught. According to the police, some officers who were on patrol around 10pm on the day had been drawn to the noise of the scuffle between Wasiu and his lover. The men had tried to mediate when a toy gun allegedly fell from Wasiu’s body. When interrogated, the suspect allegedly confessed to be a member of a three-man gang which specialised in dispossessing stranded motorists of their valuables. “The officers sighted him beating up his girlfriend by the roadside. They stopped to mediate in the dispute when a toy gun fell off his body. “The suspect attempted to run away immediately the toy gun fell off, but he was promptly apprehended and taken to the RRS headquarters,” a statement by the RRS said. Wasiu was said to have initially claimed that he picked the toy gun from where he was sleeping under the Adeniji Adele Bridge. “I found it where I was sleeping. I picked it up to go and destroy it when I had the misunderstanding with my girlfriend,” he was quoted to have said. The suspect reportedly later confessed to be a member of a robbery gang which dispossessed stranded motorists and passersby of their belongings around Adeniji Adele end of the Third Mainland Bridge. The police said the suspect mentioned two other suspects, Salami and Sakiru, with whom he operated at night after working as bus conductors during the daytime. The Police Public Relations Officer, Lagos State Command, SP Chike Oti, said the deployment of police officers by the Commissioner of Police, Edgal Imohimi, in the Third Mainland Bridge had reduced crime in the area. He added that the police were on the trail of other members of the gang. Oti noted that the suspect had been transferred to the Federal Special Anti-Robbery Squad for further investigations.